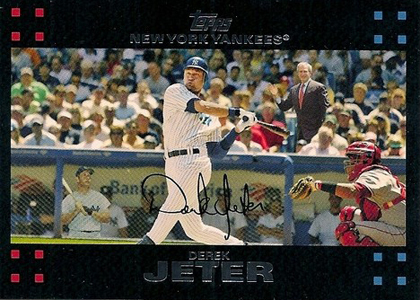 Home » Baseball » What Is Going on with the 2015 Topps Derek Jeter Card? What Is Going on with the 2015 Topps Derek Jeter Card? The 2015 Topps Derek Jeter base card is going crazy. At least in one instance. Your eyes deceive you not. A plain 2015 Topps Derek Jeter base card sold for $100 on eBay. And was paid for. The seller, Brent Williams, confirmed that the buyer immediately completed the sale. Does that mean that the card is worth $100? Not even close. This is an instance where it's a major outlier, an anomaly likely purchased by someone who doesn't collect a lot of baseball cards. Topps has been stressing the fact that this is Jeter's final base card, something that was picked up by multiple mainstream outlets. Word apparently got to the buyer who proved that something is worth what someone is willing to pay for it. Just don't go listing your 2015 Topps Derek Jeter cards expecting to get close to the same. That said, there seems to strong interest with many selling for between $5 and $10. While still high, it doesn't seem unreasonable. This is reminiscent of the 2007 Topps Derek Jeter card that had Mickey Mantle and President George W. Bush crudely Photoshopped into the image. The card got mainstream buzz, many speculated its rarity and, for a while, they were going for more than $100 each. It turns out that it was just the regular card. Today they're worth a fraction of what they once sold for, but it's still one of the more notable Topps Derek Jeter cards. Likewise, there's nothing special about the 2015 Topps Derek Jeter beyond it being his last as a player. It's a regular card. It just happens that one seller had the right listing at the right time. If you have an extra card sitting around, you might want to see what happens. Just don't be shocked when you get a more reasonable price for it. John � No. He has sold dozens of others at more down-to-earth prices. I don’t think a Derek Jeter base card is worth potentially wrecking your reputation on. Shortly after this sale, a gold parallel /2015 from a different seller went for more than $100. Just because something is an anomaly doesn’t mean that people are up to no good. It’s often a case of people spending money without doing research. Wow. 3rd pack I bought i got a red Jeter #1. Only 50 made. Whats its worth ? Are you kidding me a base Jeter #1 for $100.00 Gee I am sitting on a Derek Jeter # 1 SN 2015 Gold card should I get $200.00 for this one or more. I think that auction on eBay or even a right out payout was nuts. Special cards may bring more cash. 2015 Topps Series-2 HOBBY HTA Jumbo Box 1 Auto 2 Relic (Kris Bryant RC Jersey)?